Finland's Pharaoh Overlord have distilled thirty years of rock music into a slow, blistering, bubbling, psychedelic ooze. This is the third studio album from the acclaimed Finnish stoner/hypno gods. Pharaoh Overlord are a 'three piece' from Pori featuring Janne, Jussi & Tomi from the mighty CIRCLE. Musically it's a little bit more trippy and 'stonerish' than Circle - the vocals are gone but the hypnotic riffs are still evident and to the fore. Pretty much a perfect cross between the spellbinding guitar loops and rhythmic pulse of Circle and the stoner vibe of the 70's rock obsessives. This is trip music in the old sense. It owes as much to the likes of Sabbath as it does to Can. Laidback mellow jams to trance inducing repetitive rhythms. "They're new to me, but Finland's Pharaoh Overlord have been around for a good five years now.An offshoot ofavant metal droners Circle, they'vebeen saddled with the slightly unfortunate term 'stoner rock', but don't let that put you off. These boys don't need any chemical assistance to do some very nice things to your brain; just a few strings, pedals, sticksand, er, skins. Acouple of minutes into the opening "Test Flight" and it's clear that they mean business. Riding on a crisply insistent motorik groove, masses of electric guitars weave plangent chords, punctuated by dirty feedback squeals. This approach sets the tone for the rest of the album; "Blackout" gives us an almost bluesy single chord shuffle, while "Laivaus 17" is a 13 minute groove of almost Can-like proportions. Tomi Leppanen's drums are so in the pocket they haven't seen daylight for months, while the guitars tracepatterns of bubbling, skyscraping ecstacies orlock into tiny chordal phrases. Things get abstract on "Autobahn" (not a Kraftwerk cover, unfortunately) as Janne Westerlund and Aki Feltonen generate distended, filthy slug trails of feedback, hum and amp-melting noise beforegetting back intoa slower-mo groove for "Octagon" and the sublime "Journey", where guitars and rhythm section drift in and out of phase like a lo-fi edition of 80s King Crimson. If you fancy a listeningexperience that's by turns cosmic, dystopic and deeply transporting, then give this bunch a try. 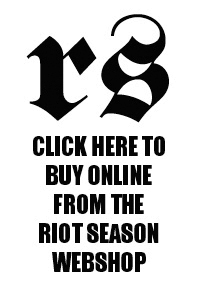 You won't be disappointed, trust me." 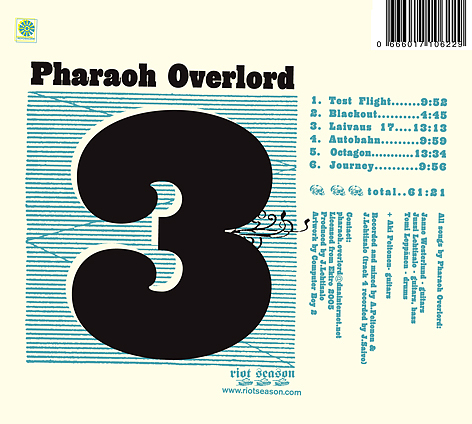 "If you happen to be a fan of both vintage krautrock acts as well as some of today’s finest current crop then there is an excellent chance that you’ll be quite pleased by the seriously rocking sounds contained within Pharaoh Overlord’s new full-length album, #3. The band’s sound is tightly focused on creating involved and engrossing multi-layered psychedelic rock tapestries. There’s no need for anything silly like vocal work to get in the way of this central mission so they have cast such foolishness to the side. The Overlord’s calling to engrossingly rock the listener is so intense that they created a six track album where five of those tracks are right at ten minutes long (or more). That's plenty of time to get completely lost in the music. “Test Flight,” the album's first track, is a heavy and straight-up rocker. While that might seem like a trite description, in this time when a true good and heavy instrumental rock jam is hard to find it is indeed great praise. The guitars start up immediately and they waste no time while kicking straight into a heavy, heavy jam that is just as rich in Janne Westerlund and Jussi Lehtisalo’s dueling, noodling guitars as it is in Aki Peltonen’s metronomic and intoxicating backbeat. 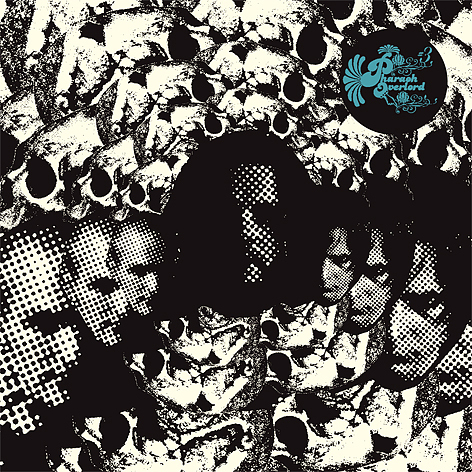 This solid foundation and rich, dense psychedelic layering is present throughout the duration with the drums always providing an anchoring point for the various guitar explorations. This overall blueprint can be seen in a number of the album's various intoxicating tracks. Again and again, the band repetitive phrases pull you in and leave you in a trace-like state, a state that doesn't even slow down as the songs move from track to track. That said, don’t worry - there’s more than just rhythmic instrumental rock goodness going on. “Autobahn” moves away from the structure and format found on most of the rest of the album and provides a ten-minute session of heavy guitar feedback and destruction. It’s hard to tell exactly what sort of carnage was left behind in the band's wake, but it had to be massive. The entirety of #3 is stunning. 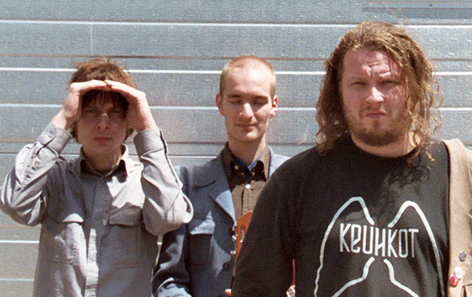 Such excellence can hardly be seen as surprising when you realize that the band’s core is comprised entirely of long-time members of Finnish kraut living legends Circle. It is a welcome addition to the collection of any fan of Circle and most anyone interested in the present (and future) of psychedelic rock." Whoo-hoo! Hypnotic as ever, here's the third studio album (and fourth disc overall counting the live Battle Of The Axehammer) from Circle's so-called (by us) "stoner rock" side-project. Well now we'd have to say that stoner rock tag is a bit inaccurate, an oversimplication. I mean, we were kinda hoping they'd always stay "heavy" but I think that they're not so much "the stoner rock version of Circle" now, than they are simply a stripped down, instrumental Circle with more psych guitar action. Very very krauty. This actually actually sounds a lot like Salvatore, as much as Circle, for that matter. Which is most definitely a good thing! Stacked up alongside the rest of Pharaoh Overlord's albums, it's not so dark as II, not so fried and blown-out as Battle, and probably comes closest to #1. And it's definitely something stoners are still gonna dig, but while they do heavy it up riff-wise sometimes, the psych aspect is laid-back and mellow just as much. Can you imagine the vibe of that last Dead Meadow mixed with a Circle style rhythmic pulse? This is all about tracks like opener "Test Flight", a druggy ten minute psych-jam, or track three, an epic, but almost funkily tight number called "Laivius 17", that builds up over 13 minutes and 13 seconds, getting more and more psych-guitar-skronked until it snaps -- into track four, "Autobahn", nothing but a droning, distorted guitar-burn solo. It's ten minutes but I wouldn't mind it for a whole album! That then swivels into the tick-tock, low-key groove of "Octagon". Very Can, that one. And on it goes... If only Pharaoh Overlord/Circle could come up with a way to make their cds automatically repeat when they reach the end, that would utterly satisfy the Circle aesthetic. Of course, you, the listener, will probably want to hit play again, but that's assuming you're not too zoned out to move your arm.